A London-based ETF and another that trades in New York together attracted around $327 million in new money since the beginning of January. 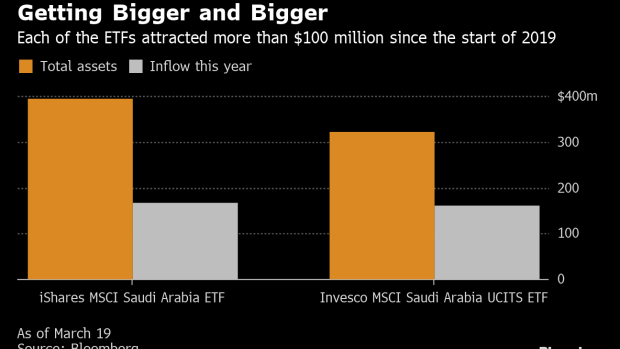 The net flow as a percentage of assets for Saudi Arabia funds increased about 48 percent this year, more than any other country in a ranking compiled by Bloomberg, after Croatia. The appetite for ETFs offered by BlackRock Inc. and Invesco jumped as the $539 billion stock market becomes included in major benchmarks tracking developing countries. FTSE Russell began adding Saudi stocks this week, in the first of five stages to be fully implemented by March 2020. MSCI Inc. will follow suit in two tranches later this year. Read more about foreigners buying shares directly in Riyadh by the most on record.